Born on Long Island, but currently living the dream in Hollywood, I'm a die hard Mets fan since birth. Raised in the era of Doc and The Kid, I long for the days of Shea Stadium and another championship. Over the last couple of weeks, ESPN has been running the film “Catching Hell” from their exquisite 30 for 30 series. Directed by Oscar winner, Alex Gibney, the made-for-television documentary details the story of one Steve Bartman. Bartman as many may recall has been labeled the most recent scapegoat for the Chicago Cubs championship drought after he ran interference for Cubs left fielder, Moises Alou; reaching out over the stands for a foul ball that Alou was destined to make a play on. The umpires quickly ruled it fan interference, gave Luis Castillo of the Marlins the base, thereby opening the floodgates for what became an eight run inning late in game six of the 2003 NLCS. The move as believed by many cost the Cubs their long warranted shot at the title. In truth, curses are no stranger to baseball. One need look no further than the 1986 World Series where the then perennial losers, the Boston Red Sox, had the New York Mets down to their last strikes, but thanks to Bill Buckner and a comedy of errors that followed, the Sox lost and had to wait nearly two more decades for their first World Series since 1918. Inasmuch as hexes are familiar to baseball they are common in all walks of sports. The Detroit Lions have the Curse of Bobby Layne, whom after being traded in the 50s put a jinx on the team for 50 years (though based on their season thus far, perhaps it’s finally over). There’s the Madden Curse. where If you end up on the cover of the Madden football video game, you’re all but guaranteed to go down in injury or failure (just ask Eddie George, Daunte Culpepper or Michael Vick). The Buffalo Bills can’t seem catch a break once losing three Super Bowls in a row, and in the NHL . . . no Canadian hockey team has won the Stanley Cup since the early 90s! Talk about futility. . . . . and then there are the New York Mets. Yes, let’s move back to the matter at hand. This is a baseball blog after all. 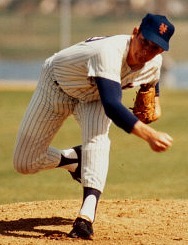 In December of 1971, the Metropolitans traded a promising young pitcher named Nolan Ryan to the California Angels as part of a four-player package for veteran infielder, Jim Fregosi. At the time, future Hall-of-Famer, Ryan was lacking control and simply didn’t fit in with the Mets long terms plans. This trade, as we know, is a decision that haunts them still some 40 years later. Currently, the Mets and the San Diego Padres are the only teams in major league baseball not to throw a no-hitter. The Padres retain the luxury of having been around seven years less than the Amazin’s, but that’s not saying much for them either. So, what is it that’s our beloved Mets back? Have they even come close? The answer is: yes, they have; on too many occasions one might even say. Here’s a quick rundown on a few of the Mets “one-hitters” throughout their history of which there are 35! Every couple of years, the Mets get close to removing themselves from such an inauspicious club, but it never quite happens. Looking at the current Mets starting rotation, there is promise for them to land that elusive but well lauded pitching achievement. Both Jon Niese and R.A. Dickey have had recent one-hitters. Johan Santana, when healthy, is almost unstoppable. However, it’s hard to look at Mike Pelfrey , who may or may not be back, and Dillon Gee and go — these are our guys. We also have to remember that a lot goes into a no-hitter. Of course, your pitcher having the night of his life is of great help. Fast pitches, strong control, and an even temper, but for every quality start by a pitcher he is still far reliant on his fielders to back him up and deliver not just the spectacular, over-the-fence grabs, but also that routine play up the middle. If Angel Pagan loses one in the sun, it’s no one’s fault but his, but that box score will record that hit and so will “one-hitter” history. There’s no way to predict when, how, who, or where the Mets will get their very first no-no. Fifty years is a mighty long time to be without anything. Twenty-five years without a championship isn’t so fun either. On the bright side once a Mets pitcher leaves his Flushing confines he is wiped clean of the curse. ; just ask Dwight Gooden, Mike Scott, Hideo Nomo, Tom Seaver and David Cone, all of whom pitched no-hitters AFTER leaving the Mets. As for Jim Fregosi, remember him? He went on to his a solid .233 average for the two years he was with the Mets. it kind of balances things out when you consider Nolan Ryans’ 324 wins, 222 CG, 61 SHO, 5714 K and yes, 7 no-hitters. Are the Mets cursed? On paper they are. Maybe they should just sacrifice a goat or something. Until then, follow Mets Today on Facebook for all the latest Mets updates, scoops and insight. Let the offseason moves begin! The New York Mets opened the floodgates yesterday by announcing their new season ticket packages and detailing the numerous changes that they will be implementing in an effort to retain season ticket holders as well as to incentivize new would-be buyers for the 2012 season. The biggest announcement coming out of Flushing since the end of game 162, so far, is that no season ticket holder will be seeing an increase in their invoices for the upcoming season. In implementing these changes the Mets also are moving their ticket issuing services to Tickets.com and introducing Dynamic Pricing, a system currently employed by the Arizona Diamondbacks, St. Louis Cardinals, and Oakland A’s among other MLB, NBA and NHL teams. Single game tickets go on sale in March, but until then it’s important to examine just what all of these changes mean to the average Mets fan. Looking solely at the numbers, the Mets have done their homework and delivered to their faithful a season ticket offer that would entice even the financially strapped to fork over their hard earned or in many cases, saved, cash. Nearly 15,000 of the 41,800 seats will be available on any given day for less than $25, and a limited amount of full-season packages will be retailing for less than $1,000. What does, however, float to the surface are the other changes that the Mets have made to accommodate these additional box office savings. Upon restructuring their seat pricing for a third year in a row, the Mets have also moved up their deadline for their various “early bird” incentives. The Major League Baseball Winter Meetings do not begin until December 5th, presumably around the same time that the free agency market begins to rear its head; most specifically for the Mets, the free agency of a certain Dominican shortstop and 2011 NL Batting Title holder. This date lags nearly a month behind the Metroplitans announced November 7th deadline for season package renewal and due payment in order to participate in the Amazin’ Mets Perks Program, which will be expanding in 2012 with additional benefits and exclusive experiences yet to be fully detailed and outlined. To clarify, before you even begin to gain an understanding of where Sandy Alderson and Team Collins will be taking the Mets in 2012, you need to decide if you’re on board with their agenda. It’s important to remember that as a loyal fan you’re there to support your team through thick and thin, but as Alderson has already announced that the payroll for next season might drop as much as $40 million dollars, you begin to wonder if perhaps all these discounts are at the detriment of the 2012 season. The biggest change facing the Mets and their ticketing system is that of the newly introduced Dynamic Pricing for single game tickets. When these tickets go on sale early this Spring, they will initially be offered at prices at or below 2011 cost. These prices will then be adjusted on a real-time basis before and during the season, either upward or downward, purely based on market demand. Powered by Qcue, Inc. the system is meant to provide all fans with a variety of pricing options, but in reality it borders on ticket brokering. The seats have a floor price that will never dip below what season ticket holders have paid for equal seats, however, making matters incredibly difficult for your average fan is the fact that there is “no ceiling” on the cost of the tickets and they will rise based upon “what the market can bear.” In other words, if you and your family of four are looking to attend that Mets vs. Phillies matchup or Grandpa wants to watch his beloved Cubbies square off his adopted Boys from Queens, and both teams are presently in a pennant crunch or just perhaps marginally above .500, then be well prepared to pay through the roof for the opportunity to do so. In introducing Dynamic Pricing — a system that seems to be spreading consistently throughout organized sports — it seems that the Mets are either betting on, or against, themselves. Which of the two it is remains most unclear. When pushed on what the team would be doing for families in the hopes of bringing more of them back to the ballpark amidst a potential price gouge, Howard offered no specific details. He acknowledged certain promotions from the 2011 season including kids getting in for free and student rush tickets, but either couldn’t or wouldn’t speculate or detail what was on tap for 2012, deciding to focus more on the larger revenue based season ticket holders until the other packages go on sale next year. Like much in the world, the 2012 season for the Mets is full of uncertainty. Battling back from another crushing season filled with injuries and a high level of financial uncertainty, the Mets do seem eager to make it up to the fans. Are they delivering all that they can and more? Perhaps not, or at least not at this point in the early post-season/off-season. As the Boys of October hang up their hats and the winter months roll in, we’ll gain a greater appreciation for what’s in store for the team, until then we will all have some hard decisions to make and Mets Today will be here to keep you company. As always be sure to follow us on Facebook for all the latest New York Mets news and updates. Mets Today has always been a fan of tales of Mets nostalgia. It’s been nearly three years since the last game was played at Shea Stadium, thus ending a thirty-four year era of fastballs, scorecards and silhouetted baseball players bathed in neon as night fell on the stadium. Too often during its waning days as the home to the New York Mets, the Flushing-based ballpark drew the ire of fans as well as opposing players for its ramshackle appearance and antiquated ways. Much like its Long Island neighbor, the Nassau Coliseum, Shea became an icon for a team that had had short bursts of success surrounded by years of frustration and defeat. However, inasmuch as the Mets faithful were eager to welcome Citi Field into their lives and in turn hopefully bring about a new era of baseball, there was something special about Shea, something endearing. It was a place Met fans called home. There are also quite a few things about Shea that many of us never knew. As the New York Mets season all but came to a close this week with Daniel Murphy and Jose Reyes landing on the disabled list alongside their hobbled teammates, Johan Santana and Ike Davis, there still remains a case of optimism for the faithful. Outside of Flushing, there’s a pennant race brewing and the Kingsport Mets are right in the thick of it. Currently two games behind the Elizabethton Twins, the Rookie League Metropolitans affiliate is on a tear, winning six out of their last seven with one more game still to play against the lowly Pulaski Mariners.